Fried chicken is one of those meal’s that often has a Grandma’s favorite recipe—steeped in history and not to be altered. The memory of eating this childhood favorite is the benchmark for excellence. These 10 restaurants have hit that benchmark and more with their menu tributes to what has become known as a definitive comfort food. The trend of fried chicken and waffles takes on a new twist with a new interpretation by the chef here—a savory chive waffle is topped with spicy fried chicken and drizzled with maple syrup. Also on the menu, honey-butter topped biscuits, made from scratch daily, are accented by deep-fried chicken pieces with a hint of Sriracha in the breading. Outdoor seating—so bring YOUR loyal hound. This family-run business bills itself as a place with “Homemade food that makes Grandma and Poppy proud!” Their broasted fried chicken makes the whole family proud. Broasting, a combination of pressure cooking and deep frying, makes the chicken incredibly tender by sealing in all the juices. Chicken is cooked-to-order, so there’s a bit of a wait. Buy it by the piece—two, four, 10, 16—and take some home. There’s no fire here, just the enticing aroma of sizzling chicken fried chicken, a juicy, breaded fried chicken breast smothered in a creamy gravy. This home-style restaurant is a community mainstay that just serves good comfort food. It’s a place that feels like home at Sunday afternoon suppertime. Smokey, the restaurant and the Bear, are local favorites. This old-school diner serves up fried chicken three ways—on their buffet, as a meal on the menu and by the bucket to go. It’s crispy on the outside and tender and juicy on the inside—finger-licking good from start to finish. Choices off the menu are good-sized and the buffet is all-you-can-eat. A community favorite that provides home-style cooking at home town family prices. This restaurant, set in an old west town, serves a smattering of southwestern favorites and some comfort food with a southern flair. It’s an amalgamation of tastes and flavors and cultures. 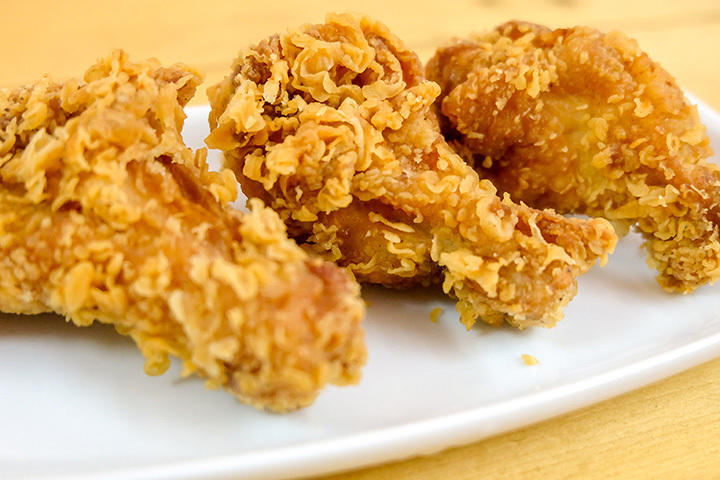 The deep-fried chicken, the southern leg of this cultural triangle, is made the traditional way, dipped in milk than flour than milk, for a crispy, crunchy skin and moist interior. It’s a meal that sends the message … you’ll be back. Take a small step back in time when you walk into this brew pub located in historic Downtown Gallup. Walls are covered with local memorabilia and photos and the ambiance is straight out of 1950s diner chic. The fried chicken plate, of course served with mashed potatoes and gravy, does the chef proud. The crispy coating has a hint of sweetness which pairs nicely with the salty seasoning. Fun, local place for a relaxing and comfort-filled meal. This is one of those restaurants that has a loyal burger following, but not surprisingly they do other menu items really well. The chicken fried chicken plate is on par with the burgers. Crispy, piping hot when served, it’s got that crunch factor that makes you realize there’s a chef in the kitchen who knows how to cook. Family-owned, farm-to-table and a locally-sourced menu that changes daily, all help to make a meal here uniquely delicious. If you’re fortunate enough to be there when fried chicken is on the menu, it’s a treat not to be missed. It comes two ways: golden and crispy on top of a waffle served with spicy hot sauce and buttery, maple syrup; as a crunchy, mouthwateringly good meal topped with a smooth, rich gravy. So worth the road trip up into the Sangre de Cristo mountains. What is New Mexican soul food? Grab a meal here and you’ll find out. Fried chicken is all over the menu. At lunch, try the southern fried chicken sandwich, a taste sensation of bacon, caramelize onions, pepper jack, lettuce and tomato. When dinner rolls around have a breakfast treat: southern fried chicken and waffles. Try it on a cornbread waffle or with cracklins’ on top. Don’t miss the honey pecan battered chicken. Add any flavor of fried chicken to any salad, too. Put on your best Sunday go-to-meetin’ clothes and head to dinner here for traditional old-fashioned Sunday supper. The highlight is the fried chicken (only served on Sundays). A free-range chicken breast and thigh that’s been dipped in buttermilk, rolled in flour and fried in a cast-iron skillet is comfort food personified. The meal comes with mashed potatoes and gravy, plus a side of vegetables. You’ll want to sit a spell after indulging!